While the colors and textures of the planet Saturn are not a stunning as those of Jupiter, its rings make it one of the most recognizable features of the solar system. Galileo was the first to identify the ring system of Saturn in July 1610, however to him the rings looked like “buldges, which he thought were a pair of “bodies” that do not move around the planet like Jupiter’s satellites – maybe Saturn was a “triple-bodied” system (The Planets, by Dava Sobel; 2005). Sometimes he called them a pair of handles and other times he called them “ears” but he never figured out the true nature of the rings. 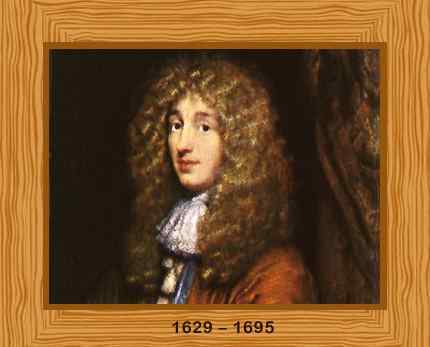 It was Christiaan Huygens in 1656 who figured out that the “handles” of Saturn were “a broad, flat ring nowhere touching , and inclined to the ecliptic” (The Planets, by Dava Sobel; 2005). HPL described how Huygens accomplished this in a number of his astronomical articles (Collected Essays: Science, Volume 3 by S.T. Joshi, 2005). Originally Huygens thought of the ring as solid but over time the ring was observed to be composed of several bands (HPL, Ashville [N.C.] Gazette-News, 13 March 1915) and the Voyager missions identified that the rings are composed of tiny to large particles of ice and rock that are constantly bumping into each other but are still retained as ring due to the gravitational force of Saturn – 180,000 miles long but with a mean thickness of only about the height of a 30-story building (The Planets, by Dava Sobel; 2005). 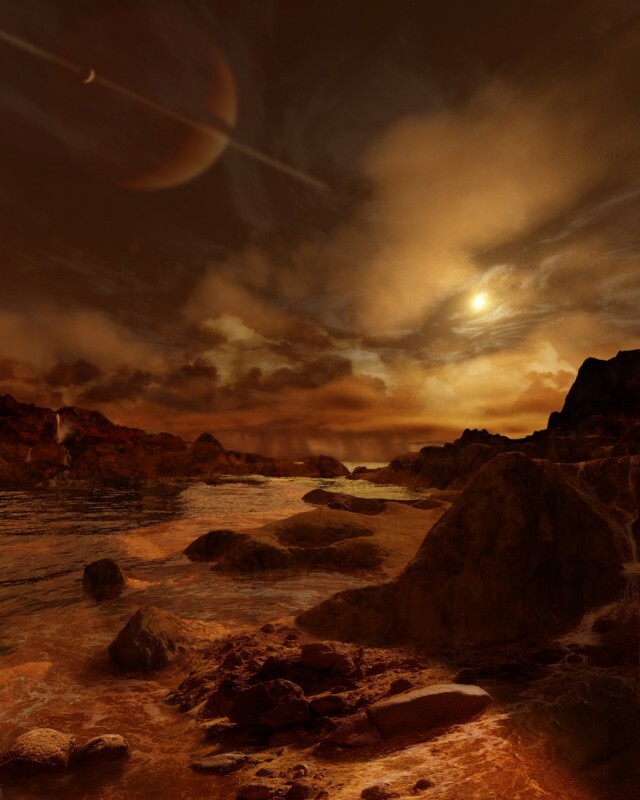 Huygens also discovered Saturn’s largest moon Titan in 1655. From 1671 to 1684 Giovanni Domenico Cassini identified another four moons while two more were discovered by William Herschel in 1789. Other moons were sporadically discovered over the centuries and currently the count of Saturnian satellites is at 53 (solarsystem.nasa.gov). 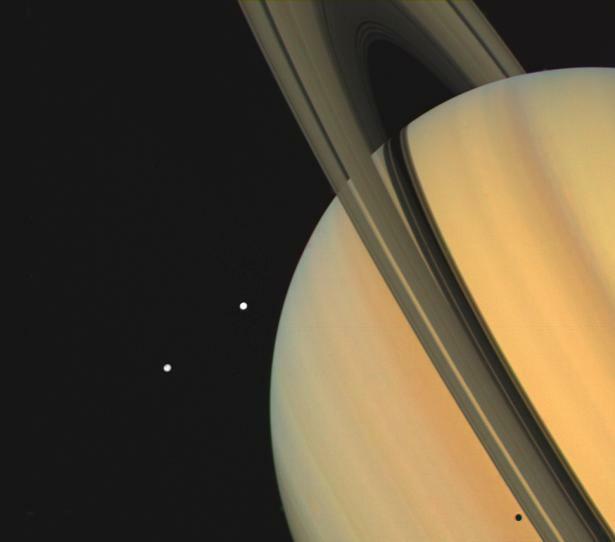 In HPL time, at least when he was extensively writing on astronomy, Saturn was thought to have 10 satellites, more than any other planet, five of which are visible with an “ordinary telescope” (Collected Essays: Science, Volume 3 by S.T. Joshi, 2005). 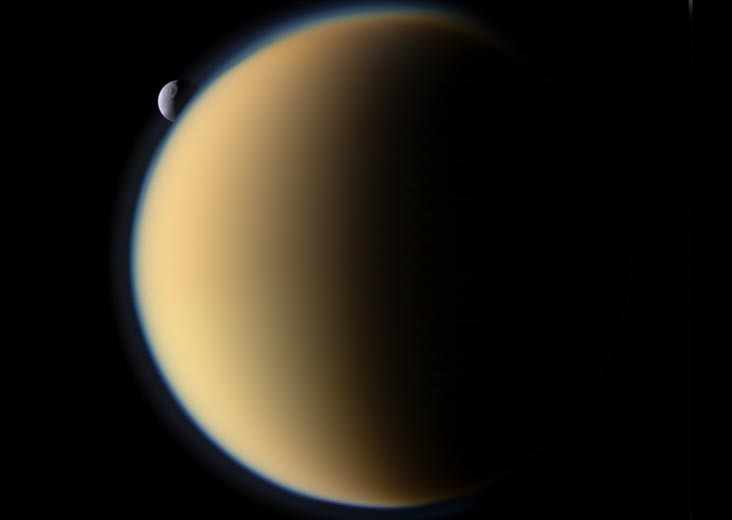 Titan is the largest moon of Saturn and the second largest moon in the solar system (Jupiter’s Ganymede is the largest moon in the solar system). Titan is a very unique satellite; it is the most Earth-like of any of the moons in our solar system. It has an atmosphere and weather, as well as lakes, seas and flowing rivers but of liquid methane and ethane and not of water (solarsystem.nasa.gov). Because of this liquid organic soup, it is thought Titan may harbor life but if so, it would be very different than life on Earth. Next time we review how HPL used Saturn in his fiction. Thank you – Fred.